Notes: Gauge was a huge problem with this sweater. I had many starts and the fabric would grow and grow as I knit. 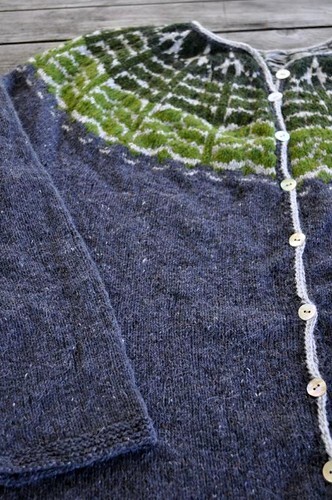 Eventually when I finished the colorwork the sweater grew quite a bit more with blocking. I ended up cutting off about 4" from each sleeve and knitting new cuffs. I also used Rowanspun DK in yoke mistakenly believing it was Felted Tweed. The Rowanspun is larger so the yoke of the sweater is a bit big. Overall I'm really happy with the colors and the feel of the Felted Tweed and I think this will see a lot of wear come fall. 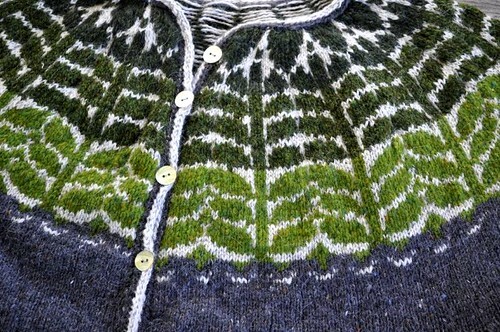 Look at your pretty cardigan! It is beautiful - I love the colors. YAY! 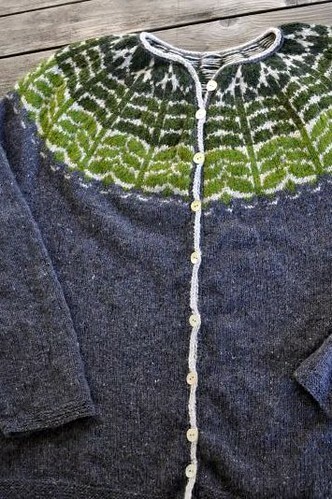 Congrats on finishing up this fantastic sweater! All the time, sweat, and tears was well worth it! The second layer of icord made it. Now we need the.m picture of you wearing it. Absolutely gorgeous! You did a great job; I love the colors.